As Albert Camus said "A man without ethics is a wild beast loosed upon this world". The supermarkets are today's wild beast, profit continues to be their sole master, and governments are unable to tame them. George Monbiot wrote in The Ecologist in 2000 "British supermarkets enjoy more political influence than almost any other corporate sector in Britain. Their huge financial muscle helps them to bend both local and national government to their will". Influence is also on the inside of government. Lord Sainsbury, for example, was minister at the Department of Trade and Industry in the UK, while according to Red Star research, 'in the late 1990's Tesco executives featured on six government task forces, more than for any single company and far more than the other supermarket chains. These included Sir Terry Leahy (Tesco Chairman until 2011), who sat on the Board of Trade's Competitiveness Advisory Group'. Meanwhile in Ireland the main competitor to Tesco Ireland, Dunnes Stores, boasted 'the alleged unorthodoxy of Ben Dunne's business practices, which included funneling Dunnes Stores funds into the offshore bank accounts of a number of Ireland's political figures'. Now, Monbiot writes "The only lasting solution to (these) monopolies and monopsonies is to break them up. Do the Tories have the guts to do this? I doubt it". So why is this relevant to alcohol? 'an estimated reduction of around 41,000 hospital admissions per annum....and unemployment due to alcohol problems ...is estimated to reduce as prices increase: e.g. 3,800 avoided unemployment cases per annum for a 30p minimum price versus 12,400 for a 40p minimum price". In Ireland the same conclusions were drawn in the 2010 HSE study 'Costs to Society of Problem Alcohol Use,' which reported that 'higher beer prices were found to significantly reduce the likelihood of drinking, drinking frequency and binge drinking among underage drinkers' and these findings are supported by a thorough World Health Organisation report in 2010. 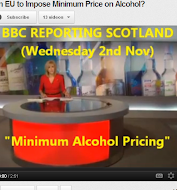 So what is the hold up in applying minimum pricing? The HSE report finds that 'large retailers (supermarkets) are increasingly using the discounting of alcohol at low prices or even below cost to attract customers ...Alcohol is used as a heavily advertised loss leader'. And they always seem to get what they want. "stack 'em high, sell 'em cheap"
For supermarkets the issue is obviously one of profit and market share. As Felicity Lawrence writes in 'Not On The Label', customers are attracted in by cheap prices on popular goods identified as Known Value Indicators (goods people know the price of well enough to make comparisons) and supermarkets 'losses on KVI's are made good in higher prices elsewhere'. The most attractive KVI loss leader has become alcohol, an addictive substance particularly attractive to the 56% of shoppers who now drink to dangerous levels. Meanwhile smaller competitors are put out of business because they cannot absorb these often below-cost prices. But, as Lawrence writes, neither do the supermarkets. Any losses incurred by supermarkets are passed ruthlessly onto suppliers who are forced to accept the mark down price themselves or are asked for 'a contribution towards profits'. This is no small matter. 'Studies in Australia suggest that over half the gross profit of the big retailers is coming from payments made by suppliers direct to supermarket head offices'. They have little choice but to comply with the demands of their biggest customers. Tax-payers are also picking up the tab for these supermarket trading practices, according to industry insiders. As reported by Shelf Life journal, "in a recent presentation to the Oireachtas Sub-Committee...Evelyn Jones (chairperson of NOffLA, the Off Licencers' Association) explained that a retailer can apply for a VAT differential refund when alcohol is sold below cost price, meaning that taxpayers are subsidising large retailers to sell alcohol below cost price". This 'insult to injury' as described by TD Kevin Humphries in the Dail (reported in Taxaton.ie) is also very lucrative. The Sunday Business Post finds that “The large retailers can claw back revenue amounting to €350 from every 1,000 units of wine sold below cost, DIGI figures show”. 'In 2005, the drinks industry vocally opposed the decision taken by the Government to abolish the ban on below cost selling in the grocery sector. We recommended at the time, that an exception be made for alcohol as it was our belief, that such a move would lead to alcohol being used as a loss leader to drive greater footfall. This has been borne out by the ensuing retailer activity since 2005, which has seen prices and deep discounting of alcohol products. Of course to introduce minimum pricing or even (though far less effectively) to outlaw below-cost selling will lead to a major legal and political challenge by the richer, better connected, more powerful and less accountable supermarkets. As the ABFI points out, "The EU Commission has in the past noted that setting a minimum price for alcohol would be contrary to the EU Internal Market, meaning ...a costly legal battle with the EU Commission'. 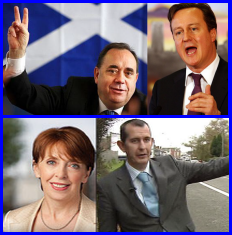 In Scotland the counter-argument has already been led by Murdo Fraser, Deputy Leader of the Scottish Conservatives. "SNP plans for indiscriminate blanket minimum pricing would penalise responsible drinkers, harm the Scotch whisky industry, cost jobs and are illegal" he said. A legal challenge by the whisky manufacturers is already under way. In the UK the “Prime Minister is very concerned about protecting traditional pubs", and has bravely dismissed Health Secretary Andrew Lansley's call for a 'voluntary approach'. Discussions continue, but the issues are already known and have in fact been on the table in all four jurisdictions since 2008. Will legislation even scratch the surface if it is enacted? As reported by the OECD , 'in 2004 two supermarket chains, Tesco and Dunnes were fined for reducing the price of nappies and baby food in contravention of the Groceries order'. A pathetic fine of 2,000 Euro was imposed. Tesco profits in the same year topped 1.3 billion, more than 2,500 Euro per second. Not surprisingly, despite abject apologies at the time, they were at it again the following year by selling below cost Coca Cola. In the summer of 2005, Dunnes successfully appealed the nappies case, and by 2006 the law had been changed to allow below-cost selling. Who is in charge, government or supermarket? The fight is on. Expect a long winded retreat. But as Camus said “Where there is no hope, it is incumbent on us to invent it.”. Claiming that the tax payer is subsidising below cost selling is a distortion of the facts. When a retailer buys an item, they pay VAT on the wholesale price. When they sell it on, they get that VAT back and pay VAT on the retail price. As the retail price is usually higher than the wholesale price, this refund is usually done as an adjustment in the VAT due from the retail sale of the product. If the item is sold below cost, there is less VAT due than has already been paid and a rebate is due. This is not public money being given to supermarkets it is a rebate of VAT which was over paid by the supermarkets. Thanks for the comment. But you make my case. A 'rebate' on VAT does come from the taxpayer, because it is drawn from public funds. The word 'subsidising' was also used by Taxation.ie in November. They reported that "a backbench TD has turned the spotlight on how taxpayers are effectively subsidising cheap booze. Labour Party TD Kevin Humphries says the Vat rebate claimable on below-cost sales “adds insult to injury” to taxpayers who have to deal with the social cost of cheap alcohol". The fact that other people, with their own agenda distort facts in the same way does not make it any less of a distortion. VAT is payable on the sale price of the item. That is the law. That is the tax system. If an item is resold there is a rebate of any VAT already paid, because it never should have been paid in the first place. This applies to all goods which attract VAT. It is not a subsidy, it is an adjustment in the amount of tax paid to the correct amount. A subsidy, on the other hand, would be where government takes money gained elsewhere and uses it to distort the price of an item, making it cheaper. Our government does distort the price of alcohol, but not in that direction. I would also like to point out that alcohol sales have been falling every year since 2002 despite the removal of the groceries order in 2006 allowing for below cost selling. This "epidemic" is declining all by itself. 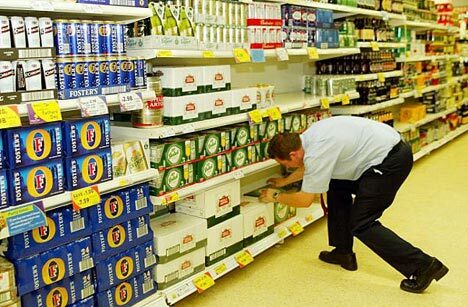 Even with the evil supermarkets daring to sell people alcohol on the cheap they are buying less of it. In the last legislative move by the Irish government on alcohol, The Sale of Intoxicating Liquour Act 2008, section 3 deals with alcohol in multiple supermarkets and states that alcohol should be seperated by structure or barrier from general grocery products,with a seperate entrance and point of sale. But after a strong lobby from the relevant bodies, this section was omitted as the legislation was passed into law. In response to Sean Billing's point that alcohol sales are declining, it actually is that the VALUE of alcohol sales has declined over the last four years. In December 2007, the industry standard for a case of 24*500ml cans of Budweiser was €37.99, in December 2011 it was €24.99. In December 2010, Tesco did a promotion on 'slabs' where it was possible to purchase 2 for €50, with all leading brands included, which was selling them at approx 20% below cost. But as Tesco refuse to reveal their sales figures for Ireland it is not possible to ascertain exactly how much was sold.And when a supermarket claims back VAT on products, they do not have to declare what the products were just what the VAt return is,this means that claiming back VAT @21% actually shows either a breakeven or small profit margin. With many small independant Off Licences struggling to survive and unable to compete it is a sad reality that many of these smaller stores are on the brink and that many people are facing the prospect of unemployment due to cut backs, closures etc. In theory, cheap drink is great, but with approx €1bn being spent every year by the HSE to deal with alcohol related incidents, Manufacturers letting off staff to reduce costs, pubs closing, off licences closing and putting more and more people onto the dole queues is the hidden cost of cheap drink. Then with people drinking to excess to pass the time as they have no work, it creates a vicious circle where far too many people are trapped. How is a separate entrance supposed to achieve anything? The Tesco in Phibsborough has their alcohol in a shop a few doors down the road, but they still seem to be selling the stuff without trouble. I'm sorry O'Sullivan's Off Licence, but it's not just price that has gone down. The figures are out there if you look for them. Alcohol sales, measured in litres of pure alcohol per capita, not price, have been falling for the last decade. The fact that price has been falling too is hardly surprising and simply represents retailers chasing a larger share of a contracting market. If demand goes down, so does price. Basic economics. Increases in alcohol duty in 1986, 1989 and 1994 did nothing to stop the rise in alcohol consumption at that time. People simply paid the extra and continued buying more. Consumption peaked in 2002 and has been falling since. All of this is measured in litres of alcohol per capita, as no other measure would be a particularly meaningful measure of what people are drinking. Thanks for the posts and link. The issue of how much alcohol is sold in Ireland per head is difficult to gauge. The Oireachtas report of Jan 2012 records an overall increase of 231% since 1960, most of it since deregulation of sales and marketing in 1990. This includes a rise of 30% from 1990 to 2002 and a fall of 6% since. But these figures can't include accurate sales from supermarkets because supermarkets do not need to publish their figures, despite their joint sales accounting for 95% of off-sales and those accounting for about 45% of all sales. Many of their sales are also loss -leaders so are of high volume but don't attract VAT, and many sales are now across the border - £189 million worth in 2010 came over the border from NI - equivalent to 756 million cans of cheap lager. If you look at the graph, or graph the figures for yourself, you will see a fairly steady rise in alcohol sales from 1960 - 2002. How you can look at that and say "most of it since deregulation of sales and marketing in 1990" I do not know. Besides, what deregulation are you referring to? Alcohol is a heavily regulated product. You need a licence to produce it, import it, or sell it. It is heavily taxed, it is illegal to buy it at certain times and on certain days and can only be consumed on private property, or on or outside certain licensed premises. It is a heavily regulated product. The sales figures do include sales from supermarkets because they come from excise figures. All alcohol produced in Ireland is strictly controlled and attracts tax in the form of excise duty calculated on the percentage alcohol. The same duty is payable on any alcohol imported from abroad. It doesn't matter where it is sold, as the excise duty is levied at time of production or importation; before it gets to the retailer. What the supermarkets do after this to obscure their predatory pricing practices, does not affect the collection of this data. This means that all alcohol legally sold in Ireland is known, down to the very last drop. The figures are also in litres of pure alcohol per capita, so population increases and decreases are already taken into account. Cross border sales are of course not included in the figures (they are inflating the figures for Northern Ireland instead), just as smuggled, home produced, or illegally produced alcohol is not. This goes as much for 1960 as it does for 2002, so I'm not sure what your point is. As a matter of fact, there used to be quite a bit of duty free alcohol consumed in Ireland and that is missing from the figures too. DIGI represent the Irish drinks sector so their figures refer to alcohol produced in Ireland only and as such they could simply show a move away from Imports to home produced goods, which is a trend throughout the food and drink sector at the moment. You would need excise duty figures to show sales including imports. You just can't tax people better. Please don't get me wrong. I'm not saying that there isn't a problem here. I am just saying that oppressive tactics have been tried for generations and yet we are still here talking about there being a problem. Pretending taxation works to reduce consumption when it clearly does not is not going to help. We need to work to change attitudes to drunkenness, as that is the only thing likely to have any lasting positive effect. Thanks for the post and the link to the Swedish study. Intersting that they record over 30% of consumption is of untaxed alcohol. We are arguing the same facts but from different perspectives maybe? I take your point about the excise figures including supermarket stocks, and that alcohol is heavily regulated as products go. By deregulation I mean specifically the legalisation of below cost selling and the uncoupling of Ireland from western norms of regulation on marketing and sponsorship which had a massive upward effect on sales, together with the 150% expansion of the off-licence market including supermarkets and garages, which led to greater availability and lower price - also contributing to Ireland's transformation into the boozing capital it has become. The recent decreases in recorded sales are small compared with previous rises, and of course emigration, mostly of young males under 25 who are the biggest drinkers, has been massive in the last three years - 60,000 in the past year alone, which means that those left are drinking more if sales are more or less constant. What is concerning, whether we can accuratley measure sales or not, is consumption which has led to a rapid growth and world record levels of liver disease, teenage binge drinking, alcohol related accidents and disease etc, many of them up by 150% or more in recent years. Like most concerned commentators I am arguing for a return to tight regulation of marketing and sponsorship and minimum pricing - easing up on these measures caused the problem and they are proven to be the best means of controlling it. Education is ineffective by comparison. Not all of the 30% mentioned it untaxed alcohol. Quite a bit of it is perfectly legal cross border purchasing, so they paid the considerably low Danish tax instead of the high Swedish one (interestingly, the Danes sometimes buy their alcohol in Germany, where it is cheaper again). In Ireland below cost selling was prevented by the groceries order and that was not rescinded until 2006, so below cost selling is only a few years old and has seen a fall in sales, not a rise. What deregulation took place in 1990? Do you have a link for me? "Western norms"? Alcohol is far less regulated in most of Europe than it is here. You have to go to Scandinavia to find stricter regulation. On population fluctuations, they are nothing new. Emigration during the 70s and 80s followed similar patterns, but the numbers here higher and alcohol sales rose anyway. As below cost selling did not actually rear it's ugly head until 2006 we had a de facto minimum price for alcohol until then. For the entire time that alcohol sales were rising from the low point in 1960 to their peak in 2002 we had a minimum price for alcohol. That price was increased many times over the years and we both acknowledge that the true consumption at any time was higher due to unrecorded alcohol sales. What makes you think that doing what failed to have the desired effect in the past will work this time? I know it seems logical that if you raise the price people will buy less, but surly you can see that that is simply not what happens in real life. Ireland has some of the highest alcohol prices and heaviest regulation in Europe and has had for generations. If heavy regulation worked, why are we not models of moderate consumption? You can't tax people better. If you make it more expensive they will either pay up or find a way to get cheaper alcohol. If you close off-licences they will drive to the next one and stock up. If you ban it altogether they will make it themselves (not rocket science, believe me) or buy it from criminals. This is a cultural problem, so an economic solution was never going to work. My point is that cross border sales, untaxed alcohol, rises in legal sales even when extra taxes are levied, all this stuff illustrates the futility of the very regulation you are advocating and I can't fathom why you cling to it. I understand why the government like this policy, they want the tax money, but I think that you would genuinely like to see the situation get better, which is why I find your continued support of a failed alcohol policy so strange. As I said, I don't doubt that there are plenty of people in this country with unhealthy drinking habits, but the solutions you propose just don't work. We need to look at countries with a better attitude than ours to alcohol and try to change our culture to emulate them. If we can persuade people that drinking is fine, but being drunk is not, then we will see the reduction in the alcohol related harm that we would both like. Welcome to this open discussion of alcohol in Ireland and the problems it's causing. Check out the Booz in the Nooz and Boffins on Booz tabs for up to date info. Is the drinks industry the best educator on alcohol harm? 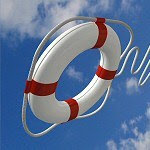 Teenage deaths rise. Is alcohol regulation in Ireland safe in the industry's hands? Boozwatch observes, reports and comments on the problem of alcohol in Ireland. Designed by FastNetWebsites.com. Picture Window theme. Theme images by peepo. Powered by Blogger.